Unbeaten Gold 60+ winners Don & Mike (4-0, 8-1) not only won 4 of their 8 games by 2 points, but also escaped Jim & Ray Hillyard in the title game, 13-11, 12-10. By again, a nail biting 2 points. This 4.0 Men's 60+ bracket was pure competition! In the 4.0 Men's 60U, Ray & Joshua battled thru similar stiff competition, winning the gold 2 of 3 games. 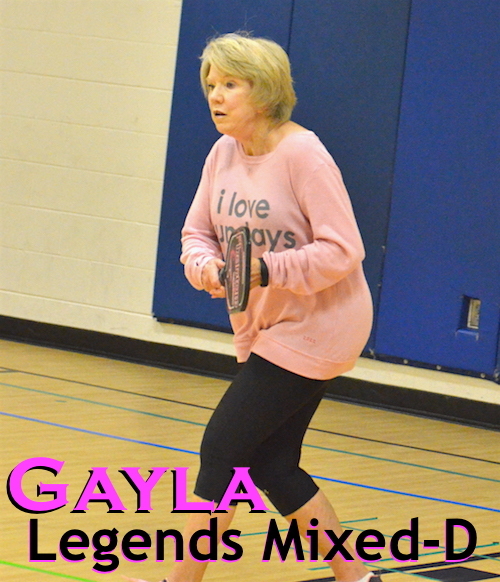 They then led the 60U medal winners in a separate "Open" Medal games vs their counterparts in 60+. The 60U (Ray/Joshua) won the "Open" Gold match-up but the big news is, 60 Under didn't sweep the Medals. Bronze and Silver went to the 60+ men! Jerry & Clark of 60+ knocked off 'Smitty' & Mike in the Bronze battle while Jim & Ray Hillyard d. Jimbo & Kevin in the open Silver. Robyn & Melissa went 2-1, in pool play (3-1, 6-3 overall) and then faced their only loss in the title game, Karen & Beth (3-0, 6-2 in pool, 3-1, 7-4 overall). This gold match went their way as they took it in 3 games. In the 3.0 W-D, Elizabeth & Jennifer (5-0, 10-1) blasted thru the tourney but needed a strong showing as Katie & Rose pushed them to 3 games in the gold match. The 11-8, 10-12, 11-7 match was close enough to have their opponents tasting gold after the 2nd game! Jimmy & Tim C had an epic Gold game vs Drago & Alan. The games went 11-9, 9-11, 11-9 tilting towards Jimmy/Tim. Drago/Alan went 3-2, 8-5 for the tourney while the champs were 5-0, 10-2. Steve & Melody earned the Gold in the toughest Mixed there was at 4.0. They went a perfect 5-0, 10-0 in pool & single elim. Raymond & Karen Hillyard won Silver, dropping the title game in 2 games. Steve & Melody were the best all around team (by stats) in the "Dink Dink BANG!" tourney this year. Steve & Adriana Pavletic earned their gold Sunday starting in pool play, where they eeked out 2 12-10 games lifting them into 1st place in pool. The 1st round in Single Elim looked bad, losing the 1st game 6-11 to #4 seed Rob R & Lori T before taking the next 2. Gold game vs Ron & Amy was similar, starting off with a 4-11 loss before putting together 2 wins, 11-5, 11-4. Dan Wright & Tracey Yensen placed 2nd in pool play before dropping their semi match. Tim C & Katie took Gold in 3.0 knocking off Jimmy B & Marty R in 3. This Gold team went 5-0, 10-3 in the tourney while Jimmy & Marty were 3-2, 7-6 overall. This Pool Play story could be #3 Gabriel Hollies & Rebecca Arjen who went 1-2, but lost 3 games in pool play by 2 points. Easily could have turned them from 3rd to 1st. 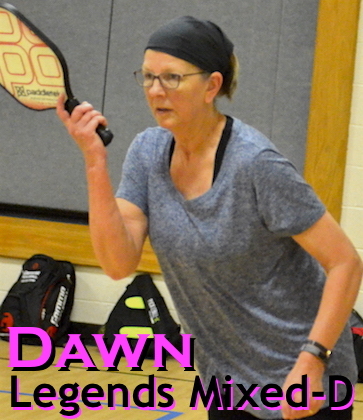 Or maybe even Joseph B & Monica P. They knocked off the eventual Silver medalists 11-3, 13-11 in pool and were edged out for the semi's in tie-breaker by Mike K & Carol S.
Talking about stories! 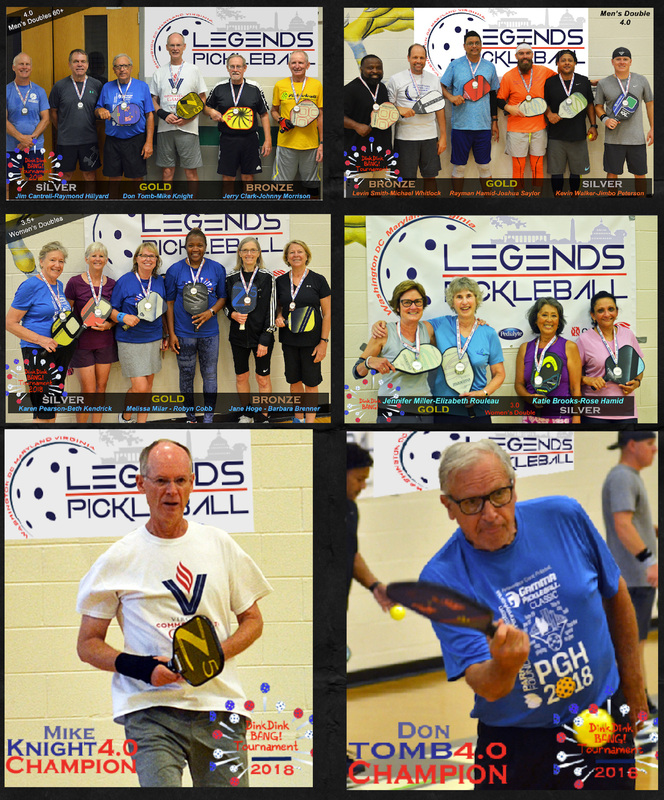 Gold medalists Mark & Kristen Cahill knocked off Marc & Gayla for Gold only 3 weeks after stepping on a pickleball court! Talk about catching on quick! Look out 4.0's, newbies are on their way! Jim Cantrell proved that an Open Gold Champion can be overlooked by the untrained eye. Cantrell wasn't pushed by anyone in the Singles bracket of the tourney, giving up 6 points max except to eventual #4 Steve Vozza, 16-14. Silver went to Jimbo Peterson and Raymond Hamid took bronze, though going 5-0 in pool play. There was a heavy field of contenders.. Drago (3-3), Jeremy Lasich (3-3) Melody Litzenberg (2-3) and a few others. "rock the red - Pickle me Pink" (dink cancer) tournament on Oct 20-21. 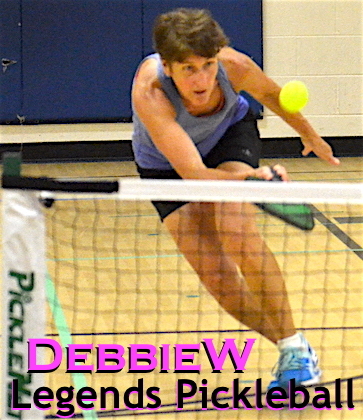 It'll be on pickleballtournaments.com soon! Cost is $30 per participant, $15 per event. Team participants must register individually and list team partner in registration. Participants are limited to one age bracket per day. Team's age bracket determined by age of the younger partner. If there are enough registrants at various skill levels within age groups, the Tournament Director may separate age groups into a variety of skill levels. Skill level bracket (if applicable) for teams is determined by the skill level of the higher rated partner. Tournament Director reserves the right to change the format and adjust the age/skill brackets based on registration. Tournament format (double-elimination/round robin) will be determined based on registration, though double elim will be the probable format. Detailed tournament schedule and format details will be on website Wed., July 4th. Each participant will receive a complimentary tournament t-shirt. USAPA rules apply – Decisions by Tournament Director and Head Referee are final. Some age divisions and skill levels have been combined. This is a non-sanctioned tournament. Round Robin Format: Games to 11 win by 2 against all the teams in your bracket. Players call their own lines unless it is a medal match. Medal matches MAY have referees. 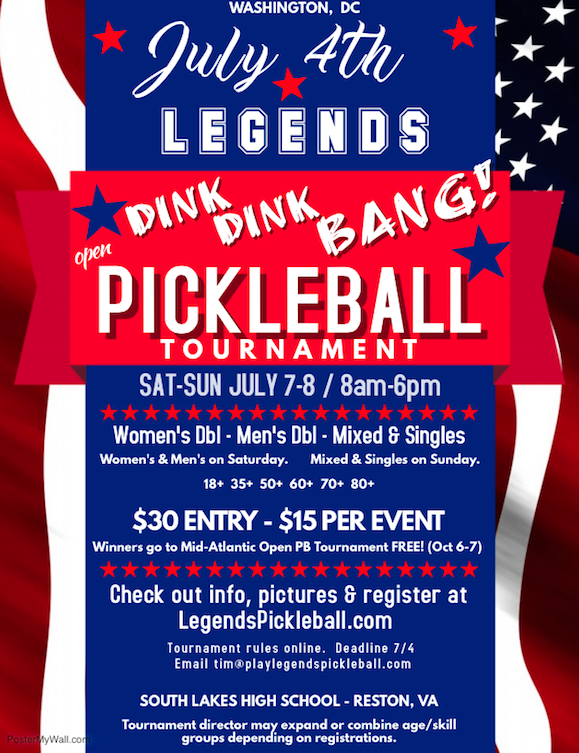 If you're interested in officiating, please let me know (tim@playlegendspickleball.com). You may bring a water bottle and a towel. Please feel free to bring chairs with rubber based feet. We want to make sure we keep this beautiful high school gym floor prestine!